It's a birthday party AND a performance BY the Birthday Boy! Yes, William Shakespeare will give you insights into himself, his plays, his era. Plus, there'll be cake. ​You like cake, don't you? In the lot right off 23rd Street, marked in green on this map. 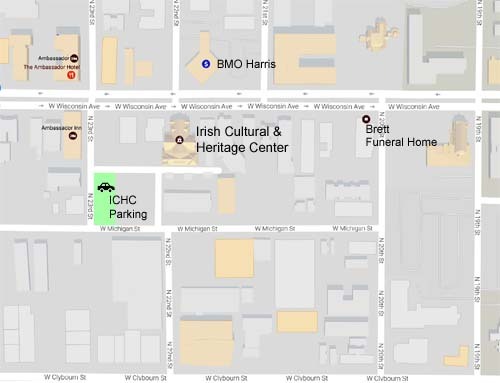 You may also park at BMO Harris Bank (across Wisconsin Avenue) and at Brett Funeral Home (east end of the block) during non-business hours. The most famous playwright in the English language was also an actor, a student and a very human Man of His Age. 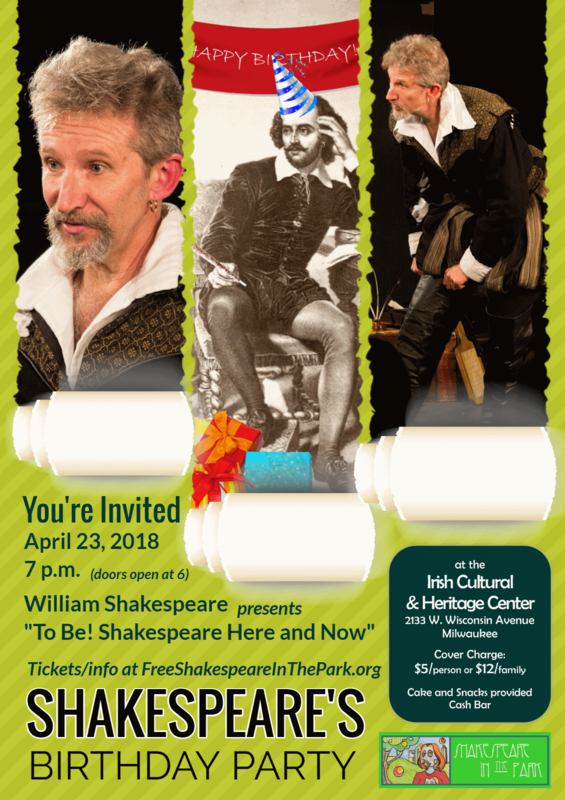 Milwaukee's Shakespeare in the Park has made an annual tradition of celebrating the birthday of The Bard, and this year, HE gives the gift to YOU, in the form of his one-person show "To Be! Shakespeare Here and Now!" in the first open public performance in Milwaukee since...? "But, what IS 'To Be?'" you ask. "To Be!" is Humorous - Shakespeare used comedy to entertain his audiences, and "To Be!" follows suit with hilarious scenes, ridiculous characters and outrageous history. "To Be!" is Interactive - Audience members take the stage, casting insults, learning manners and playing roles including Crab the Dog. "To Be!" is Dynamic - portrayed by Ron Scot Fry, an actor and a teacher, but also a clown and a stuntman. Every show includes a swordfight, and if "To Be!" is a one-man show, then who ...? Plus, cake. You remember the bit about the cake, right? And, help us publicize this event by downloading and posting/sharing a flyer! !